Mario sliding, which occurs when he plays these sliding courses. Slides are secret places found in certain levels in Super Mario 64 and Super Mario 64 DS. 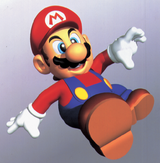 When Mario approaches one, he will slide down on his front or back, and he can speed up or slow down when sliding. Most of the time the player should avoid going too close to the edge since they all lead to a void. The player also has coins to collect and completing the slide results in a Power Star. This slide is the shortest of the three in the game. It contains 80 Coins, a Blue Switch, and a 1-Up Mushroom hidden at the end. It is the only slide course that is not located in an actual level. It can be accessed by passing through the stain-glass picture of Princess Peach on the right in the room on the second floor. It contains two Power Stars; one of them can be found in a ! Block at the end of the course. The other one appears after completing the slide in less than 21 seconds. It is also available as a playable course in the downloadable multiplayer game for Super Mario 64 DS. Note that falling off this stage does not cost the player any lives. Mario racing on the Penguin Racetrack. The Cabin's Snow Slide is the only slide that has an intentional shortcut; however, the player should be careful when using it. If the player races the Big Penguin and uses the shortcut, the Penguin will not give them the Star, even if they win the race. The track is made of snow and ice, so it is slippery and thus fairly hard. It contains 82 Yellow Coins and one Blue Coin that only appears at the beginning of the course, two 1-Up Mushrooms (both in the shortcut), a ! Block that contains a 1-Up Mushroom, and a Star (the reward given to the player by the penguin if they win). At the very end of the race, there is a thin bridge made of sheer ice. To access the track, one must enter the chimney of the cottage at the start of the level. The Mysterious Mountain Slide features sharper turns and detours, and even a trick path. The track has 3 1-Up Mushrooms and a Star at the end. In Super Mario 64 DS, there are 45 Yellow Coins in the slide. This track is also required for the 100 Coin Star in Tall, Tall Mountain for Super Mario 64, as it contains more than 35 Coins. However, it is not required for the 100 Coin Star in Super Mario 64 DS, as there are more Coins available outside the slide. If the Star appears on the slide, it must be obtained right away, or it will disappear due to the loading point separating the slide and the mountain itself. To get to this slide course, the player has to go near the top of the mountain (just past Fwoosh) and find a place that looks like an ordinary wall, but is accessible like a painting. It is just behind the row of five coins. In Super Mario 64 DS, the coins are positioned differently so that the entrance to the slide is more obvious to the player. ↑ (June 10, 1998). Course 4 - Star 1: Slip Slidin' Away. Nintendo: Super Mario 64 Strategy (Internet Archive: Wayback Machine). Retrieved February 23, 2018. ↑ (June 10, 1998). Course 12 - Star 7: Collect 100 Coins. Nintendo: Super Mario 64 Strategy (Internet Archive: Wayback Machine). Retrieved February 23, 2018.